Born in Osaka in 1938. After graduating from Osaka Shoin Women's University, Nasaka exhibited artwork made of cardboard perforated with countless holes at the 15th Ashiya City Exhibition in 1962, and won the Mayor's Prize and Fifteenth Anniversary Prize. In 1962, she also exhibited at the 47th Nika Art Exhibition and the Joryu Gaka Art Association Exhibition. The same year, she began studying under Jiro Yoshihara and, the following year, she became a member of the Gutai Art Association, to which she belonged until it disbanded. 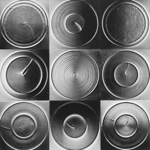 In 1964, at the solo exhibition she held at the Gutai Pinacotheca, she exhibited a large work that covered an entire wall, in which she had strung together works made with a motif of concentric circles using turntables. Her aim was to encompass the whole space by emphasizing repetition of the same motif. For a time in the latter half of the 1960s, she also tried her hand at kinetic art that employed magnets. In 1970, she was in charge of the dome patterns for Hall 4 of the Japan Pavilion at Expo '70. 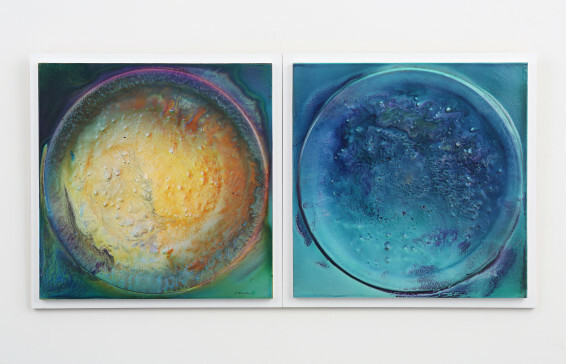 She has continued to create two-dimensional works since the disbanding of the Gutai Art Association.